Coryell County records can be obtained from the county clerk in Gatesville, with vital records since 1903 available at the county or state level. Earlier records, if still extant, have been published in books, and can be obtained from the Genealogy Section of the Texas State Library. The Coryell County clerk can be contacted in person, by mail, email, or phone; online requests can be make through TexasOnline, the official eGovernment site for the State of Texas. While certified copies are restricted, informational ones are public records. 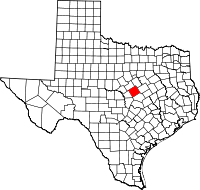 Coryell County was formed in 1854 from Bell County. Anglo-Americans settled there circa late 1840s; the Native Americans were the Tonkawa.